Globe (Fair Usage Policy) telco companies in the Philippines has the right to capped your bandwidth limit at their own disposal. For Globe Prepaid subscribers (800MB) and for Postpaid subscriber (1GB) per day, while this is a huge for some users, but not for internet savvy users (those subscribers who always do downloading and video streaming). But I'm going to share a few tricks to bypass the allocated data. This trick is only for educational purpose only! Note:Globe is using 2 apn which is "http.globe.com.ph" and "www.globe.com.ph"
(1) http.globe.com.ph (Globe Inet) is the default APN - This APN is fast and stable, but this is also the APN that is capped (throttled) when abused. (2) www.globe.com.ph (MyGlobeConnect) - Not as fast as above, but it give true unlimited internet. This is the APN we will use for the trick. 3. 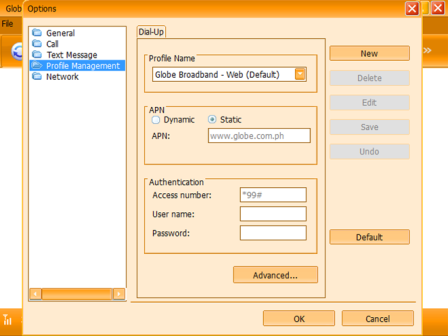 Connect using www.globe.com.ph, and then open the software PROXIFIER v3.0 ( you just downloaded). All you have to do is to input any website to the tool, since it will be proxified via 203.177.42.214 port 8080. Enjoy unlimited downloading and streaming via Globe 1GB Postpaid & 800MB Prepaid Plan. PS: Infotech is not responsible for anything by following this guide.